The Ejs Rocket Car on an Inclined Plane model displays a car on an inclined plane. When the car reaches the bottom of the incline, it can be set to bounce (elastic collision) with the stop attached to the bottom of the incline. The car consists of the car body, two rotating front wheels, and two rotating rear wheels. The incline angle (in radians) can be changed via a textbox and the rocket's thrust can be changed via a slider. In addition the car can be dragged to its initial position. You can modify this simulation if you have Ejs installed by right-clicking within the plot and selecting "Open Ejs Model" from the pop-up menu item. 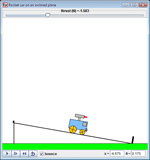 Ejs Rocket Car on an Inclined Plane model was created using the Easy Java Simulations (Ejs) modeling tool. It is distributed as a ready-to-run (compiled) Java archive. Double clicking the ejs_mech_newton_RocketCarOnInclinedPlane.jar file will run the program if Java is installed. Ejs is a part of the Open Source Physics Project and is designed to make it easier to access, modify, and generate computer models. Additional Ejs models for classical mechanics are available. They can be found by searching ComPADRE for Open Source Physics, OSP, or Ejs. The source code zip archive contains an XML representation of the Rocket Car on an Inclined Plane Model. Unzip this archive in your Ejs workspace to compile and run this model using Ejs. thanks for OSP and EJS! 4F (3-5) #1. Changes in speed or direction of motion are caused by forces. The greater the force is, the greater the change in motion will be. The more massive an object is, the less effect a given force will have. 11B (9-12) #1. The basic idea of mathematical modeling is to find a mathematical relationship that behaves in the same ways as the objects or processes under investigation. A mathematical model may give insight about how something really works or may fit observations very well without any intuitive meaning. W. Christian, F. Esquembre, and M. Belloni, Computer Program ROCKET CAR ON AN INCLINED PLANE MODEL, Version 1.0 (2008), WWW Document, (https://www.compadre.org/Repository/document/ServeFile.cfm?ID=8243&DocID=881). W. Christian, F. Esquembre, and M. Belloni, Computer Program ROCKET CAR ON AN INCLINED PLANE MODEL, Version 1.0 (2008), <https://www.compadre.org/Repository/document/ServeFile.cfm?ID=8243&DocID=881>. Christian, W, F. Esquembre, and M. Belloni. "Rocket Car on an Inclined Plane Model." Version 1.0. https://www.compadre.org/Repository/document/ServeFile.cfm?ID=8243&DocID=881 (accessed 19 April 2019). Christian, Wolfgang, Francisco Esquembre, and Mario Belloni. Rocket Car on an Inclined Plane Model. Vers. 1.0. Computer software. 2008. Java (JRE) 1.5. 19 Apr. 2019 <https://www.compadre.org/Repository/document/ServeFile.cfm?ID=8243&DocID=881>. re-purposed for a rolling solid ball, a shell, and a disc and additional features of adjustable bumpers and control of variables for promoting student centered active learning. to publicize about the simulation.